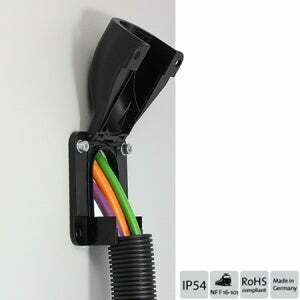 CONFIX FWS, the new generation in easy assembly of cables with conduits for machinery and equipment. The bulkhead fitting can be used everywhere there is a need for an angled assembly of protective conduits. Easy handling, robustness and a modern design are just a few benefits of the CONFIX FWS. The liftable cover is tightly fixed by a hinge to the mounting box. Both versions are available in colors grey (RAL 7011) and black (RAL 9005). KEL-ER Cable Entry System for Pre-Terminated Cables With IP65!